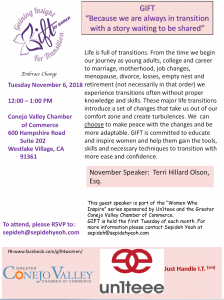 Email Sepideh to register for this event. This is a free event. Why GIFT? Because we are always in transition with a a story waiting to be shared. The idea of creating GIFT began with an increasing interest from adult students/women in the classes Sepideh teaches in personal development. We are all transitioning into the next level, often without the necessary skills, knowledge and tools to get to the next transition peacefully. It’s through these life transitions that anxiety and depression find their way into our hearts and prevent us from moving forward. GIFT’s mission and purpose is to create a loving and supportive network for people in transitional stages and inspire them to connect with their passions, dreams and skills through access to a guest lecture series, employment and volunteer opportunities, and monthly meetings that encourage personal and professional growth.